I've been thinking a lot about my detrimental reward system lately. I find my problem to be two-fold: the rewards I give myself are almost always food or alcohol, which both cost money and don't do anything for this waistline that I'd like to retract, and if I'm honest with myself, I'm rewarding myself for really basic stuff. I shouldn't get a cookie (literally or figuratively) for changing a really dirty diaper, steam cleaning the floor, or actually completing laundry from start to finish in one day. Those are things I should just do, because I'm an adult. 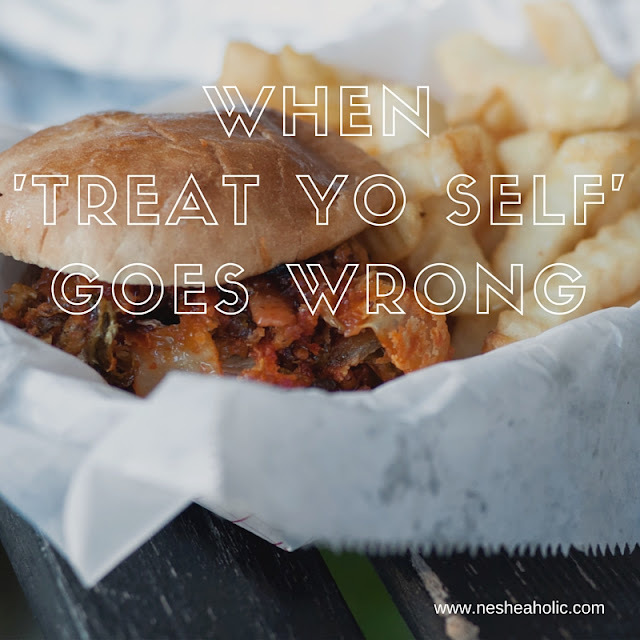 I read a post earlier this week - 23 Ways to Treat Yo' Self Without Buying or Eating Anything - and it really hit home for me. It acknowledges the need to treat yourself from time to time, but offers great alternatives to confections and wine. I've also downloaded a counter app on my phone. I'd like to keep a count of my good decisions - going to the gym, choosing the healthier food option, saying no to the offer of sweets, not spending time on social media when I have other work to do - and allow myself one treat after a long series of good decisions. At some point I started using anything as an excuse to eat badly or buy something I didn't need. I'd like to change my thinking from needing to give myself rewards to celebrating legitimate accomplishments. Completing a grant application warrants a cupcake, making it home in the rain? not so much. How do you reward yourself without going overboard? Do you have a set system in place? When I was working out I would reward myself with food only to have to go work it off again haha. Not so much anymore, I just try to do what makes me happy and not make choices or decisions that don't better me. Honestly, the only way I've been able to stop Food Reward was changing my relationship with food. Now a job well done warrants a face mask or a DIY manicure! I'm with you. When I want to reward myself for good behaviour like working out or whatever, I normally go shopping! Hard on the wallet. So now, I treat myself to bubblebaths. It's a little thing, but boy -it does wonders for the mood! I am trying to work on a system to not go overboard. I end up spending way too much rewarding myself. Loved your post. I love the counter app idea! I make so many bad "food" choices daily. It is my greatest struggle!